Do you wade, or do you Cannonball? How do you describe the feeling of fully letting loose? Perhaps it’s floating through warm air as you crash into cool water with a perfectly blended cocktail waiting for you when you emerge? We’re excited to see a growing number of Sixthman guests Living Loud on multiple music festivals at sea. In order to invite more of our cruising community to get out and escape on new adventures, we’ve launched Cannonball Club! 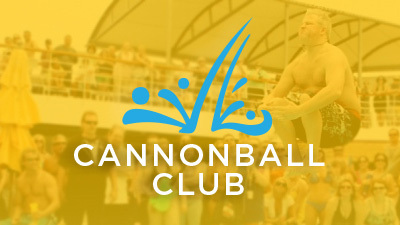 Why call it Cannonball Club? Because the Sixthman Community doesn’t wade, we don’t dip our toes in, we CANNONBALL, and few things are more exhilarating than making a splash in the world. Cannonball Club is a way to invite guests who want to experience more than one Sixthman vacation per year. The program will deliver special stateroom pricing on some of our upcoming cruises for those who are currently booked guests on a Sixthman festival. We’ve been so fortunate over the past 14 years to get to set the stage for memorable vacations for our guests. We hope you’ll take advantage of this opportunity to experience another one of our festivals, meet new best friends, discover great new bands and Cannonball into more exciting adventures at sea! For more information, go to CannonballClub.com. Since 2001, Sixthman has set the stage for moments that make life rock, serving more than 250,000 guests unforgettable vacations at sea with their favorite bands and brands. These curated and intimate events bring non-stop performances, artist collaborations and truly immersive experiences that celebrate community and aim to change expectations of what a vacation can be.